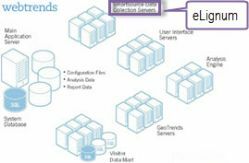 The eLignum managed & hosted SDC provides a low cost approach to the implementation of Webtrends SmartSource Data Collection. The Hosted SDC provides a fast start up SDC option to Webtrends software clients where resource constraints or limited implementation timescales are an issue. Webtrends SmartSource Data Collection provides greater accuracy, easier maintenance and more flexibility in the collection and manipulation of site statistics than web log files. Typically it is configured to use first-party cookies which are served by your own domain, largely eliminating security concerns and minimising problems with high privacy settings set in web browsers. The eLignum solution consists of two continuously monitored servers at separate data centres which helps to prevent the loss of data through server or network issues which may occur with a single server. Please contact an eLignum representative to discuss Hosted SDC implementation options or a free trial.